Welcome to Crystal Palms RV Park in Galveston TX. Located on the beautiful Bolivar Peninsula. 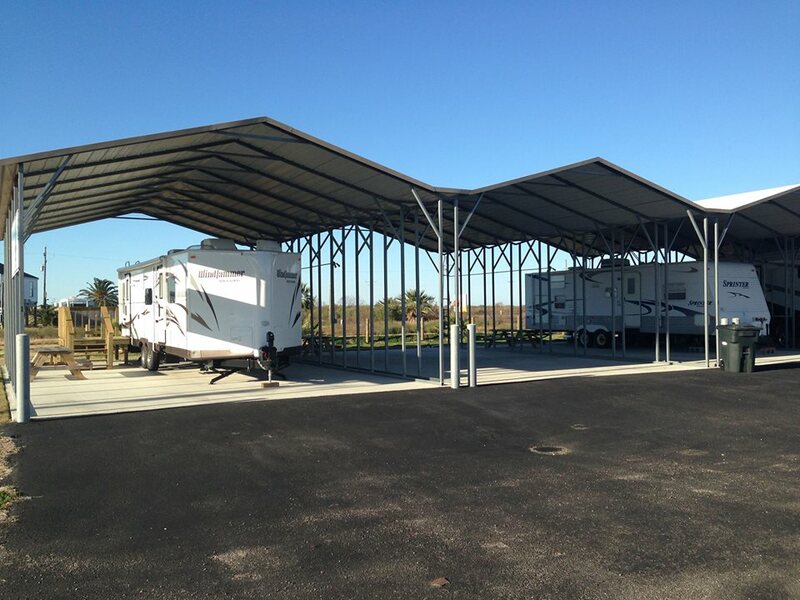 Double Wide Covered Spaces - Every RV slot has a cover with room to fit your motor-home, and your vehicle. When a storm comes, don't worry you are covered. Full Hook Ups - Each RV Park slot has full electricity to plug into. We offer 50 amp hook ups. So you can recharge while you go out to Galveston night life. Or you can stay in and enjoy the beautiful Bolivar breeze. Its up to you, either way, you will enjoy your stay at this wonderful Galveston RV park - Crystal Palms! Fully Paved - Drive up to Crystal Palms rain or shine. 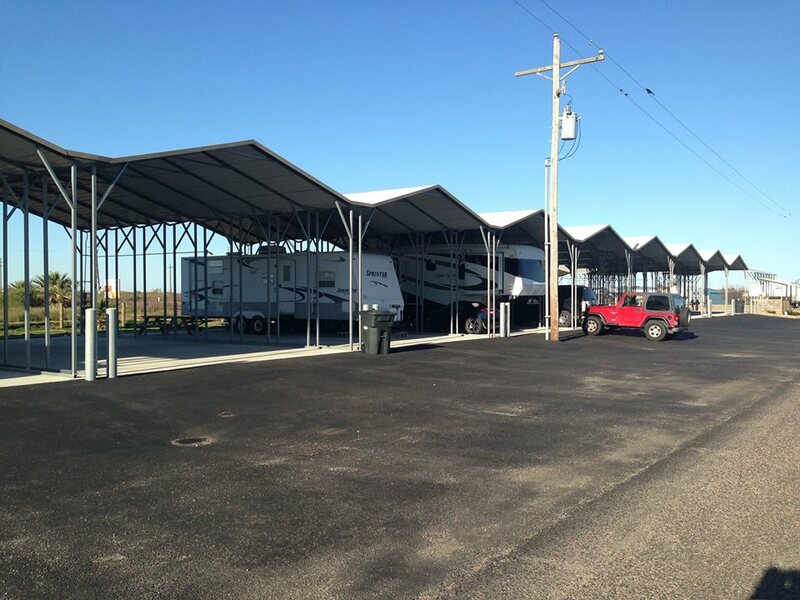 Our entire complex is fully paved and has a excellent asphalt finish. You do not have to worry about your ride being stuck in mud under wet conditions. This RV resort is a safe and relaxing place to take your family. Trust that valued luxury will be taken care of well. Plus we know that our asphalt and paving job was done right. Thanks to our Houston Asphalt Repair friends, Corestone Construction. Premium Gulf Coast Location - Crystal Palms is only a ten minute walk to the beach. So while pops is grilling up some sweet ribs, you can take a stroll down to the Galveston Bay. This Bolivar RV park provides great access to the beach. 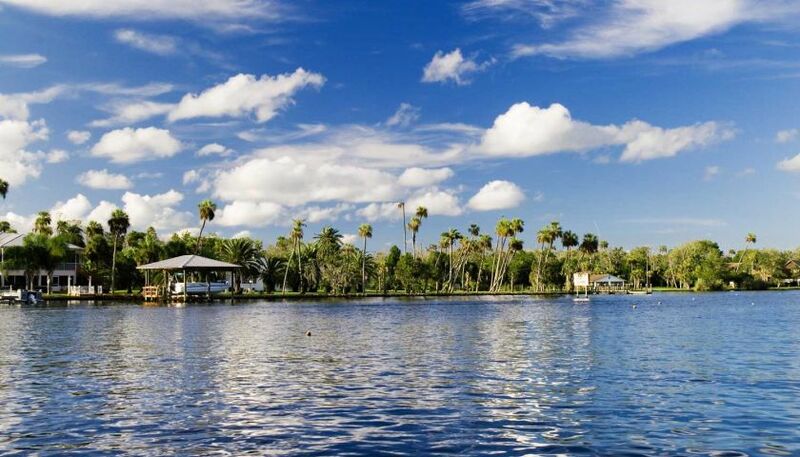 This is one of the many reasons why Crystal Palms RV Resort, is one of the best Galveston RV Parks. Reserve your spot today! 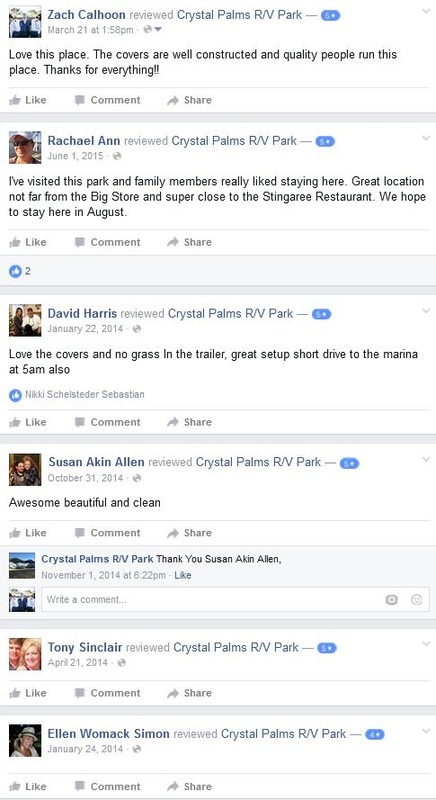 Here at Crystal Palms RV Park, we are committed to provided every guest a professional service from prompt, polite people who want to see nothing but happy guests. We enjoy a clean and well-maintained park facility that provides full hookups, and fully covered RV Sites, all within the perimeter of a safe and friendly community. We look to give each guest respect and a pleasant experience, and to thank them for choosing us as a place to call home on one of life's many adventures. "The Best RV Park In Texas"
"A Premium Galveston RV Park on the Bolivar Peninsula"
The Galveston RV Community - "We Love To Travel"
Rv travelers are a community of wonderful people. While traveling around the country in your favorite family RV motor-home, you need to take your stops very serious. Many questions come to mind when considering where to park your RV and which rv resort will give me and my family the best experience. Towable RVs or Motorized RVs, we are all the same community. And we have the same desire, to experience travel in a wonderful and unique way. We accept a wide variety of motor coaches and provide full-hookups so you can enjoy your stay in comfort. Enjoy the sun where its meant to be enjoyed - at the beach! 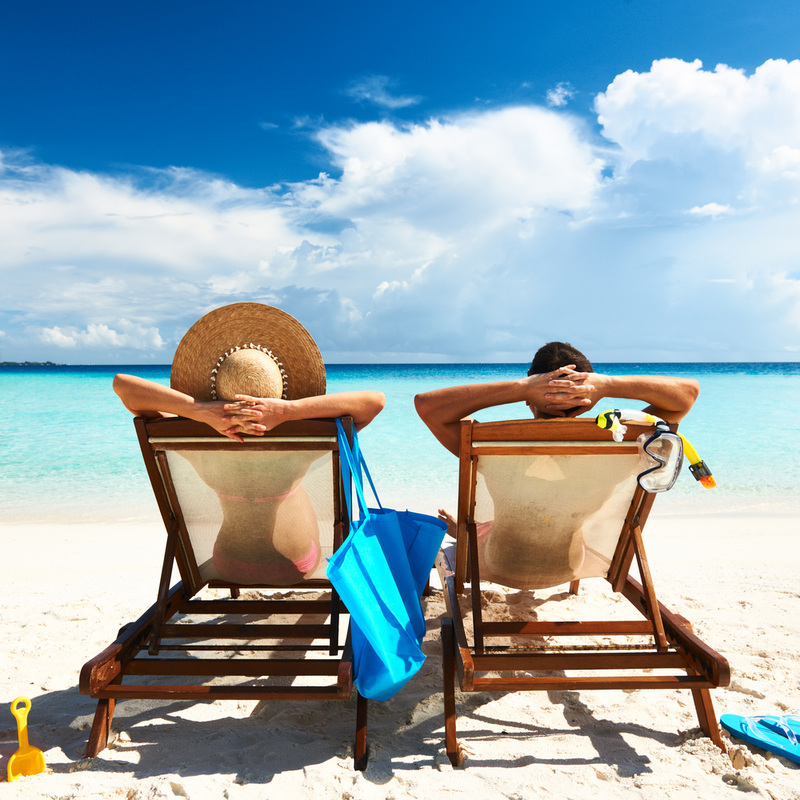 We offer fully covered spots so you and your loved ones can relax after a long day of leisure. Drive uo your RV anytime, we have smooth asphalt all over. Our community is home to short-term and long-term travelers who regularly come to Bolivar to enjoy our wonderful beach life. Many of our guests are return visitors!